The expression of one's meaning by using language that normally signifies the opposite, typically for humorous or emphatic effect. 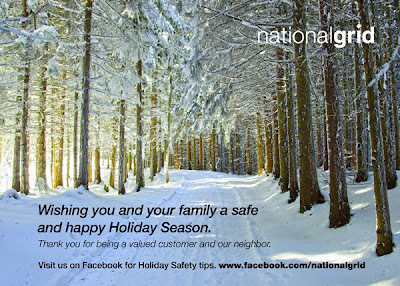 I received the above e-card today from National Grid. It's obvious that the folks in public relations don't read the newspaper, or own a television. The sentiment is nice. Ironic, but nice. Happy Holidays to you, as well. I had the same thought -- kind of "big brassy" to use an image that so clearly evokes the memory of the recent storm. Makes me think of the oft heard phrase, "Your call is important to us." What level of importance?" "Thank you for being a valued customer and our neighbor." "Valued" in that we pay your wages? "Neighbor" as in we live closer to each other than we do to Mars? This "neighbor" wording is a marketing thing, such as this theme park type greeting: "Come down often, and visit our great attraction. We're practically neighbors. 'Only a two hours by plane." Merry Christmas and Happy New Year, Wally, from folks who do truly appreciate your postings, and who do live right in your town. :-) Thank you, and Merry Christmas, and a Happy New Year to you, too!